The greatest source of carbon emissions in roads operations is traffic and this is acknowledged as having a measurable effect on climate change. The European Union has a waste framework directive which has a headline target of reducing non-hazardous construction and demolition waste by 70% by 2020. This is expected to be achieved by recycling or reusing those materials currently being dumped in landfill areas. Most ROADEX countries have similar waste reduction targets. Scotland for example has the Climate Change Delivery Plan as published by the Scottish Government. Usually people mix weather and climate when they are talking. “Climate” however is not the same as “weather”. Climate means the average pattern of weather for a particular region over a long period of time, and this varies according to natural changes. Natural gases play a big part in climate change. Natural gases work as trap; they reflect some solar energy back out to space, and trap some heat in the atmosphere. The biggest factors in climate warming are the gases known as “greenhouse gases”. Greenhouse gases (carbon dioxide, methane and nitrous oxide) are developed by nature and by human activities. Greenhouse gases trap the heat, heating the Earth’s surface. These gases act like greenhouse walls; they let visible light in and at the same time absorb outgoing infra-red energy, keeping the greenhouse warm. A low level of greenhouse gases is normal. 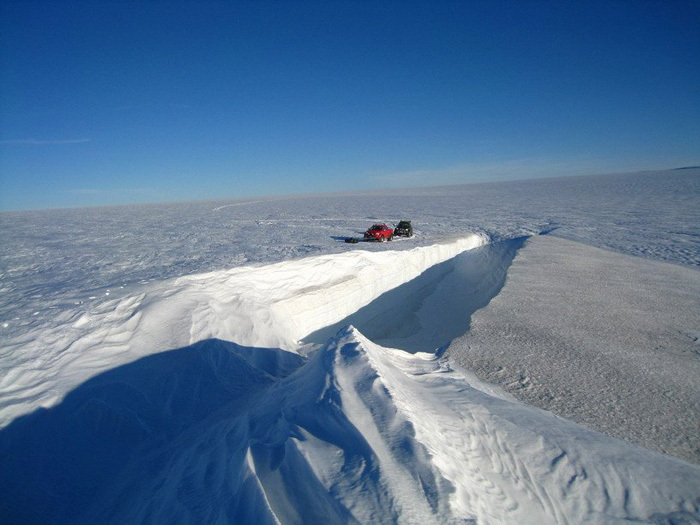 Without it the Earth’s average temperature would be -18°C. Currently the average temperature of the Earth is +15°C. Man’s activities have however compounded the amount of greenhouse gases in the atmosphere giving rise to “extra” warming. Exhaust gases affect a limited number of people. However, the problem is two-fold: Pollutants may have a small local impact, but those that spread to the atmosphere may have a regional and world impact, i.e. emissions have an appreciably greater spread. Traffic is the main source of carbon dioxide. Approximately one fifth part of carbon dioxide in the atmosphere comes from traffic and the amount is increasing. One litre of petrol produces 2350 grams of carbon dioxide and one litre of diesel 2660 grams. Carbon dioxide is end product of perfect burning and the amount cannot be reduced by using a catalyst. The only way to reduce the amount of carbon dioxide is to consume less fuel. 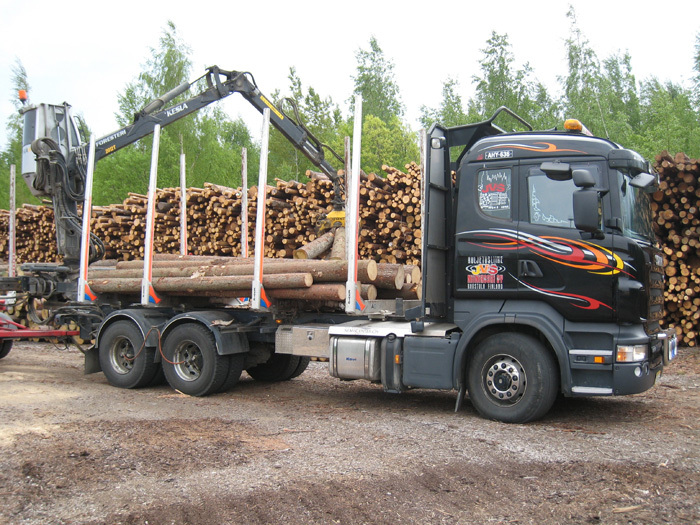 Avoid starting a cold engine and taking short journeys; if the engine is warm, the fuel consumption will be less. New cars; according to EU legislation car manufactures have to display information about fuel consumption and CO2 emissions. Tyre pressure; fuel consumption is higher with low tyre pressures. driving style; driving faster than 120km/h increases fuel consumption compared to 80km/h. At 80km/h, fuel consumption is 30% lower. Road construction, maintenance and use of the road have a carbon cost and it is important to be aware of the carbon component of each phase. Road planning and design is the first phase. What is the length of road required? The length of new road can be minimized by good planning and design. Building a bridge should be considered if the road will be shortened by about 1-2km. At this point the costs will be approximately the same, but the carbon emissions will be less. Is it possible to avoid disturbance of soils with large carbon contents, such as peat areas? If the road goes through a peat area it can lead to decomposition and carbon release. What is the best surface profile to minimize rutting and degradation of the surface layer? The amount of materials used in a road project has a direct effect on its carbon emissions (footprint). 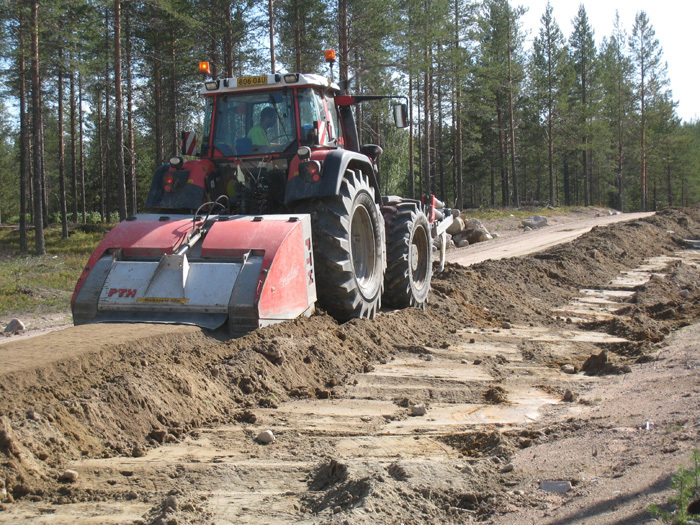 The most efficient way to construct a road is to reduce the need for materials and construction. Building a completely new road should be avoided unless it is absolutely necessary. Roads should be designed and constructed using as small an amount of material as required to achieve the specified standard. Note: the road has still to be strong enough for its planned use! The new ROADEX design technique has proven to be very good in optimizing the use of road materials. Good materials in road structures reduce the maintenance cost and carbon emissions. 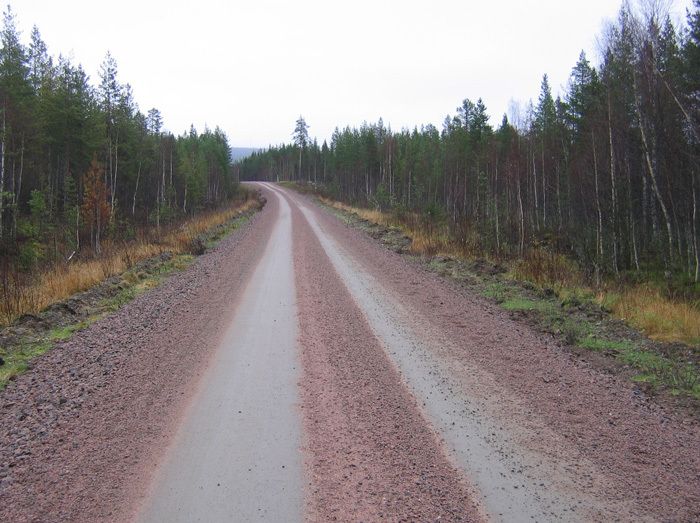 The lifetime of a road or layer is invariably longer when it is constructed with the good quality materials. The balance between the aggregate quality, haulage distance and frequency of maintenance/regrading operations should be considered in material decisions. 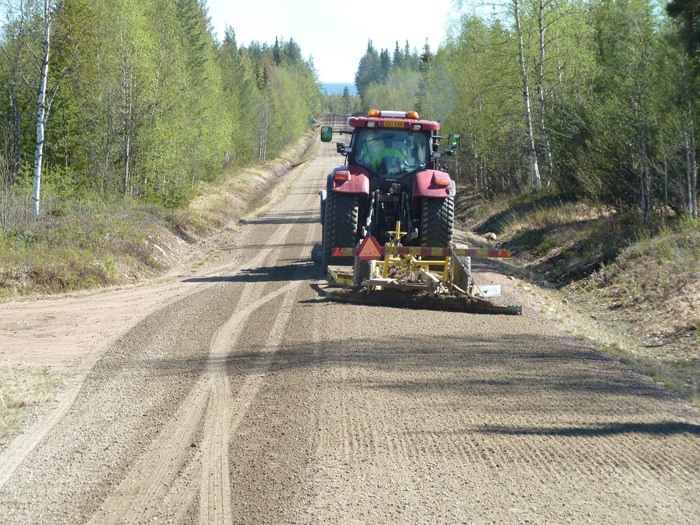 The wash-away and blow-away of gravel road materials can be minimized by the use of hard aggregates with enough suction properties (i.e. enough fines). Restricting vehicle speeds will reduce the wear rate further. The use of road salt should be minimized. 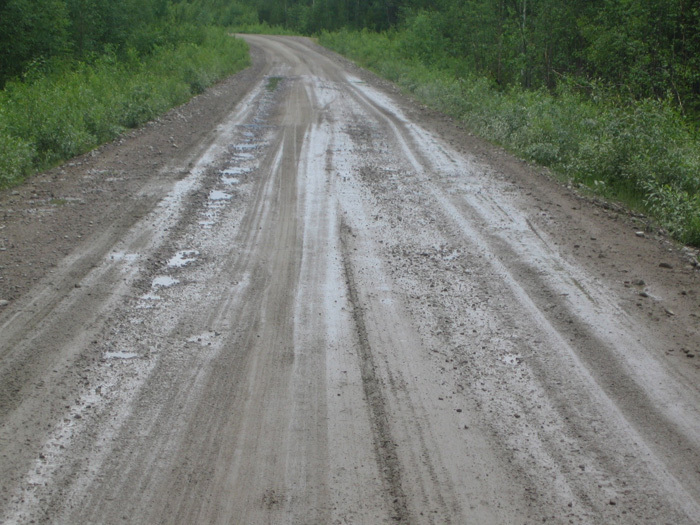 Material losses in gravel road wearing courses increases the need for maintenance. Soil loss can be kept to a minimum by using good aggregates, by good design and by good maintenance operations. In particular road drainage should be kept in good condition. Culverts should be well designed, selected, installed and maintained to reduce the risk of damage by water. Road condition surveys for road rehabilitation projects should be carefully considered. 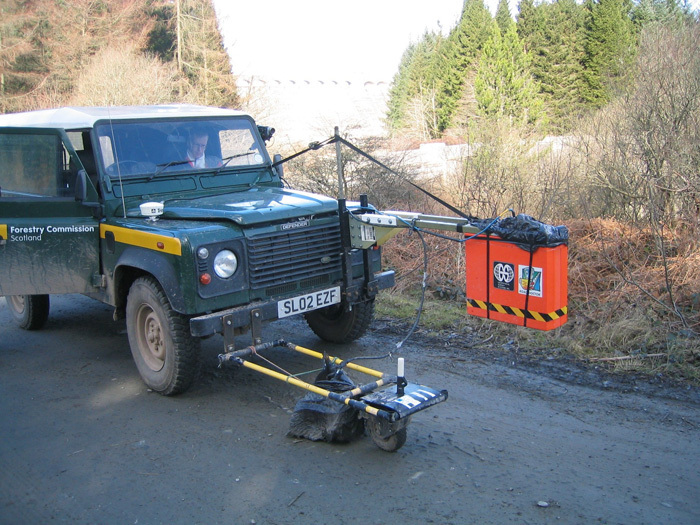 For example, ground penetrating radar and falling weight reflectometer surveys provide useful information on the existing condition of a road. With this information the most suitable rehabilitation operations can be carried out in the right places. “On the safe side” operations should always be avoided. 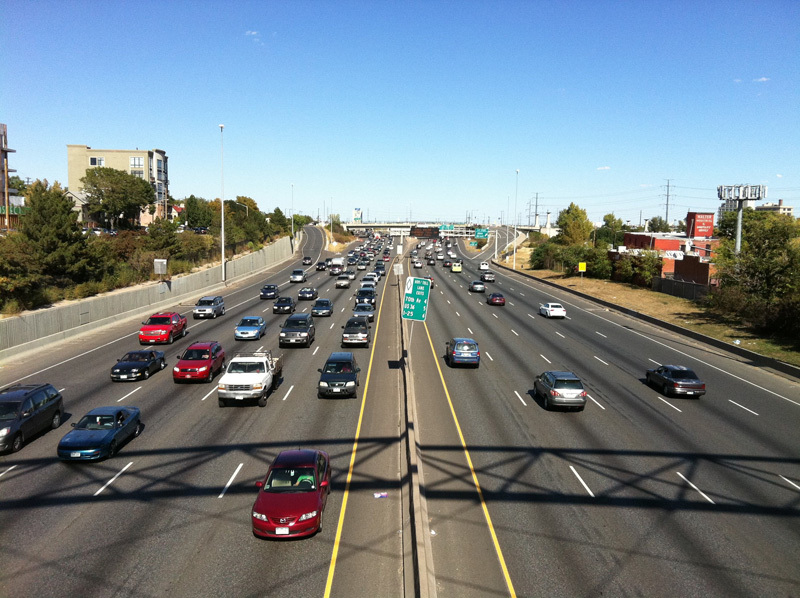 The timing of road use has an effect on carbon emissions. For example intensive road use in winter can add 20% to maintenance costs in Scotland, but similar trafficking in winter can be cheaper in Nordic countries when the road networks are frozen. Freeze-thaw conditions are different however. 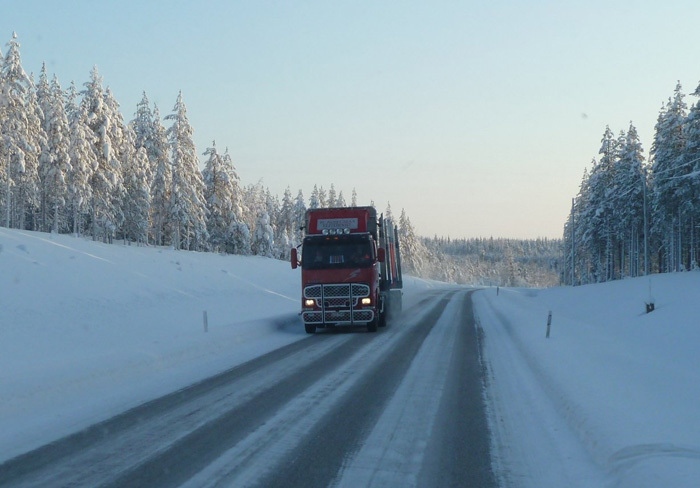 In all ROADEX countries it is important to minimize the use of heavy vehicles on roads during periods of freeze-thaw cycles. The risk for damages, and thus further rehabilitation and maintenance, increases during the spring thaw period. 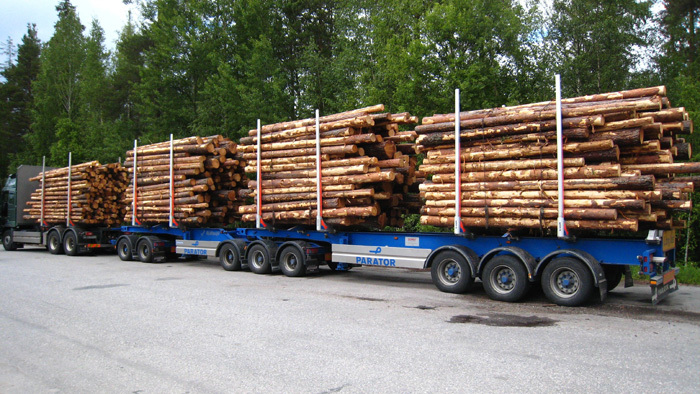 All vehicles should comply with permitted axle and vehicle loads for the road as the amount of road damages can increase dramatically when vehicles are over loaded. A good method for reducing damages on roads is the use of tyre pressure control systems (otherwise known as CTI systems). Other factors in road use that can have an effect on carbon emissions are driver behavior, speed, and methods of loading. All of these have a large impact on the durability and hence the maintenance of the road. Also the use of recovery time is respectable alternative for maintaining the road in good condition. Note: The above mentioned operations are given as having a positive effect on the carbon emissions of a road, and they also bring financial benefits too. For example if the need for material reduces, the cost of the operation similarly reduces. 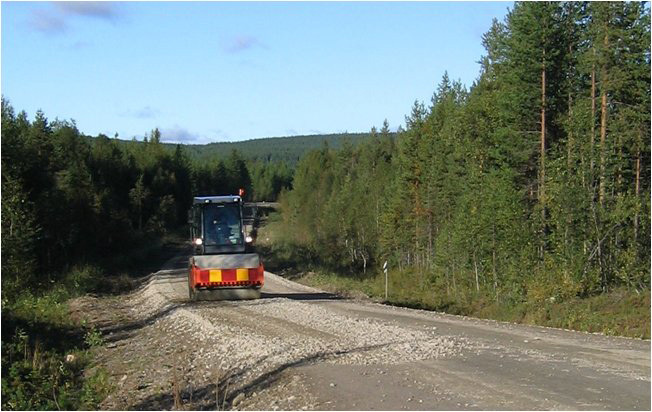 In 2011 the ROADEX project carried out research into the environmental aspects and costs of strengthening a forest road in northern Sweden. These calculations show that good road diagnostics using modern road survey techniques can save the use of materials, and have a positive effect on CO2 emissions and cost.